Ce document au format PDF 1.5 a été généré par Microsoft® Word 2010, et a été envoyé sur fichier-pdf.fr le 02/11/2017 à 15:36, depuis l'adresse IP 41.203.x.x. La présente page de téléchargement du fichier a été vue 201 fois. Taille du document: 802 Ko (22 pages). in budget deficits and debt levels, bringing into question the effectiveness of fiscal rules in enhancing budgetary outcomes. The objective of the paper, therefore, is to ascertain the efficacy of fiscal rules in engendering fiscal prudence in Nigeria. Peter D. Golit is a Senior Economist in the Research Department, Central Bank of Nigeria. (AES), Accra, Ghana where the paper was first presented. steady delivery of public services. Nigeria to the vagaries of the international oil market, making them susceptible to exogenous shocks. unprecedented growth in monetary aggregates, resulting in inflationary pressures. 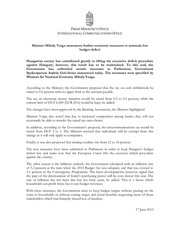 Account (ECA) for budgetary stabilization. debates in the literature on the credibility of fiscal policy. 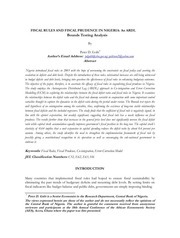 and tax effort to determine the interactions between fiscal prudence and fiscal rules in Nigeria. avoiding or moderating pro-cyclical policies (Cioffi et al., 2011)‡. to revenue and expenditure rules thereby enhancing fiscal discipline §. more consistent with medium-term targets. booms via the adjustments in fiscal variables and their linkages with other policy instruments ††. promote fiscal transparency, enhance public accountability and fight corruption. to run deficits”, and hence, “fiscal rules do not work as an effective restraint on fiscal policy”. a given country (Roubini and Sachs, 1989; Alesina and Drazen 1991). in place, as to whether a pluralist or proportional representation. §§ The conceptual framework draws from the discussions provided by Fatás and Mihov (2008). of the timing, the motivation for their occurrence may be unconnected with the electoral cycle. goods that may lead to expansion in government spending. the expectations surrounding their application in different countries. accumulation of wealth for future generations to the creation of a diversified economy. align with the rules specified under the Stability and Growth Pact. developing countries using different approaches***. *** See Tapsoda (2012) for details. more powerful fiscal rules at the 5 per cent level of significance. volatilities from spilling over to the budget (Baunsgaared, 2003). meet developmental challenges at the lower levels of government. clear and strong threat to national security and Sovereignty of the state. appropriate from the savings the following year provided the funds are for capital spending. from the capital market if approved by the National Assembly. level of government with the conditions and borrowing limits. performance targets to be submitted to the National Assembly and circulated to the public. 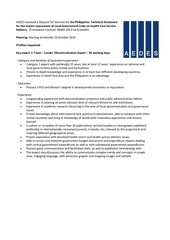 framework and the professional capacity required for Public Procurement and other related Matters. the approval powers are vested with the Council. and the delays in contract payments†††. of instituting the SWF that is capable of preserving capital in the saving fund on a continuous basis. framework and the desired constitutional backing that allows for a more stable longer-term savings. equity and tackle infrastructural challenges. rising, leading to deterioration in public debt ratios. rules are to stand the test of time in Nigeria‡‡‡. of fiscal policy rules over the study period. fiscal rules in 2003, the fiscal rule dummy takes 0 from 1970 to 2002 and 1 from 2003 to 2012. (TDR) is measured by the percentage share of total public debt in national income. Maximum Likelihood based approach and the Johansen and Juselius (1990) test procedure. time series, in the sense that it does not require all the variables to be integrated of the same order. purpose of comparison and confirmation of the ADF test results. desired level to correct for disequilibrium, by letting a distinction between the long-and shortrun behaviours in the deficit ratio. α0 and ϕ0are the intercept terms. Models (4.3) and (4.4) above were estimated to obtain the results of our long-run static models. values (the lower and upper bounds asymptotical critical values) for a given level of significance. HA: β1i ≠ β2i ≠ β3i≠ β4i ≠ β5i ≠ β6i≠ 0 for i = 1, 2, 3, 4, 5, 6. Inflation Rate (INF) and Tax Effort (TEF) were stationary at levels. However, all the nonstationary series became stationary after taking their first differences. among the variables in the two ARDL models specified above are reported in Table 5.2. (2) FTDR (TDR\ DSR, CSA, INF, TEF, FDUM). * denotes 1%, 5% and 10% significance level, respectively. and upper bounds critical values at 10 per cent level of significance. the long-run static parameters of the ARDL Model 1 above are presented in table 5.3 below. Note: ***, **, *denotes levels of significance at 1%, 5% and 10%, respectively. 59.4 percent of the disequilibrium generated from the error shocks can be corrected each year. adjusts back to equilibrium in the current year. spur expenditure above the level of revenue that is collected. deficit ratio will further enhance the fiscal position of the government. financing government programs when oil prices fall low. relationships exist among the variables. deterioration in fiscal prudence but perhaps more importantly, its impact is with a lag. August 29th to September 1st. Management, Working Paper Series, WP05/2014/DE/UECE, ISSN 2183-1815. Quarterly Journal of Economics, CII: 651-78. Annual Conference on Global Economic Analysis, Geneva, Switzerland. and R. Suescún, 2008, The World Bank, Washington, D. C. 20433. Department of Finance Working Paper 2001-16. Kopits, G. and S. Symansky (1998). Fiscal Rules, IMF Occasional Paper 162. Krogstrup, S. and S.
(TEP), Working Paper No. 0607, April. S. Strom, A. Holly, and P. Diamon (Cambridge: Cambridge University Press). Industrialised Countries,” Economic Policy 8: 99-132. And Developing Countries?” Institute for International Economic Studies, Stockholm. Vol. 2, Issue 1, January-June, pp. 1-23. No. 55, Vol.94, Lagos –June 1st. The Fiscal Responsibility Act, FRA (2007). No. 31, July 30th. The Public Procurement Act, PPA (2007). No. 14, June 4th. (MPRA), MPRA Paper No. 352, October 10th. Ce fichier a été mis en ligne par un utilisateur du site. Identifiant unique du document: 00555494.